David Nieper in Derbyshire has become the first ever British fashion manufacturer to break into Britain’s prestigious ‘Best 100 Companies to Work For’ list published for 2018 by The Sunday Times. Decades of offshore sourcing has decimated the UK fashion manufacturing industry, which has shrunk by over 90% percent since the seventies. 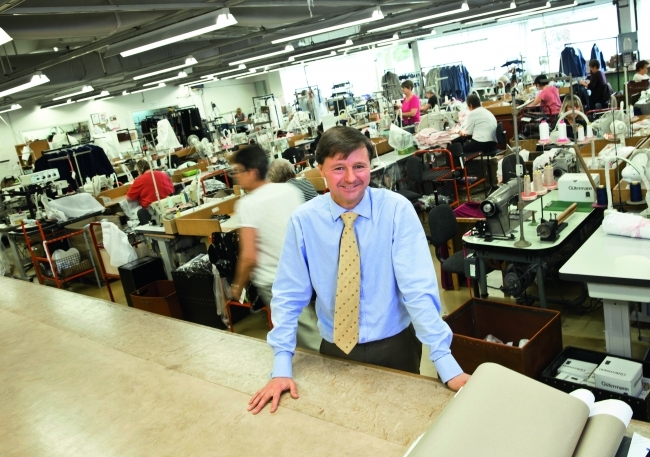 So for David Nieper, a family run fashion manufacturing firm with 280 staff, this recognition is a truly remarkable achievement. David Nieper staff had one resounding message… ‘It’s great to work in British fashion!’ The company enjoys a very low staff turnover and scored highly in the category of looking after staff wellbeing, with over 50% of the company holding long service awards of 10+ years. In comparison to other businesses in the list, the company also received a special award for ‘Giving Something Back’, indeed supporting the local community is at the heart of everything the company does and especially in its role for local education. The David Nieper approach is both altruistic and far reaching, not only creating jobs for local people, but also prioritising the educational standards and welfare of local children. Within the last two years, David Nieper has taken the unprecedented step of becoming one of Britain’s first private companies to sponsor state education in the shape of the David Nieper Academy, a secondary school built for 850 pupils age 11-18. Results from the survey reflected that staff are proud to work for their family company and believe that it is run on sound moral principles and personal growth is encouraged. The survey also revealed that David Nieper staff are excited about their future prospects working for the company. Managing Director, Christopher Nieper said: “Our place in the Best 100 Companies list is credit to our wonderful staff. We are one of the few fashion houses that have never taken production overseas and for 50 years have prioritised local people and local jobs. We are incredibly proud to be the first ever British fashion manufacturer to be included. Over the last 12 months, the David Nieper fashion house has had the most successful year in its 56 year history. The company’s performance has been attributed to its great staff and an increased consumer appetite for British Made goods. The Sunday Times Best Companies programme started in 2001 and is based solely on the results of staff surveys. A broad cross-section of the British workforce has been polled, with over a quarter of a million staff giving their opinions about their work environment and employers.